Enjoy Labor Day Event 2017 Savings and Discounts on Comfort Shoes, Wide Shoes, and More! Hurry! Lucky Feet Shoes Labor Day Event starts tomorrow! 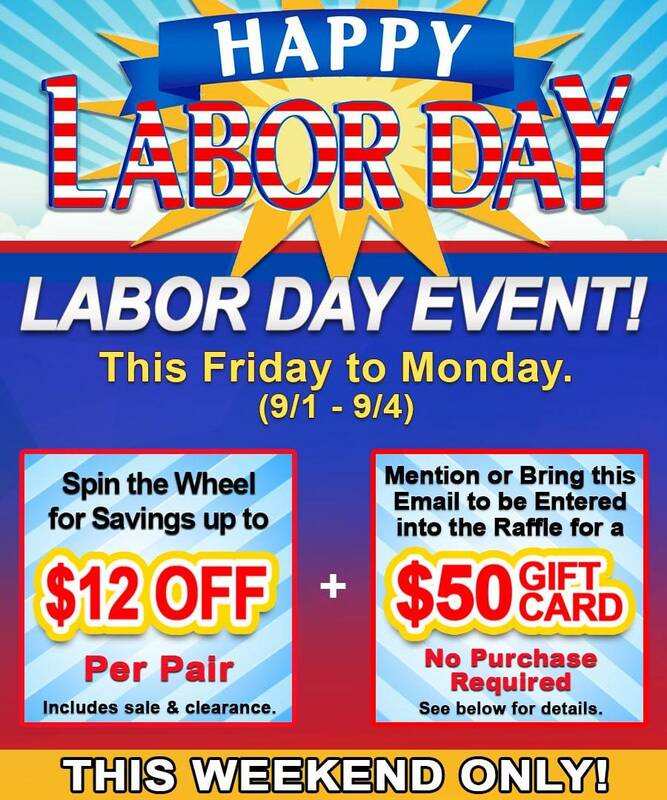 Come into any of stores to spin the wheel for Savings up to $12 OFF! * Plus, make sure you mention or bring this email to be entered in the raffle for a $50 Lucky Feet Shoes gift card. ** Labor Day Event starts this Friday 9/1 and runs through Monday 9/4. Find a store near you and enjoy our weekend only savings! *One spin per customer. Prize amounts include $5, $8, $10, or $12. Discount amount will be given to each pair of shoes on the same transaction. Discount can be used towards sale and clearance merchandise. **Must mention or show this email to be entered into the raffle for a $50 gift card. No purchase necessary to enter into the raffle. The gift card will be mailed to the winner within two weeks after the event. Come into any one of our stores located in Costa Mesa, Anaheim Hills, Rancho Cucamonga, Riverside, San Dimas, Long Beach, Temecula, La Quinta and Palm Desert, today and shop our Comfort Footwear! At Lucky Feet Shoes, we carry many comfortable shoes: sandals, heels, walking shoes, running shoes, casual sneakers, clogs, wedges, flats, booties, and boots. Come and visit us today! If you are looking for Comfortable Shoes in Orange County, the Inland Empire, Los Angeles County, Temecula or Riverside; we have nine stores to serve you! If you are looking for comfort shoes in Anaheim, Anaheim Hills, Yorba Linda, Brea, Orange, Placentia, Costa Mesa, Santa Ana, Fullerton, Irvine, Villa Park or Tustin; then visit our store in Anaheim Hills or Costa Mesa for your footwear needs. If you are looking for comfort shoes in San Dimas, Long Beach, Cerritos, Glendora, Pomona, Covina, West Covina, La Verne, Azusa, Diamond Bar or Claremont; then visit our store in San Dimas or Long Beach for your footwear needs. If you are looking for comfort shoes in Rancho Cucamonga, Ontario, Upland, Fontana, Rialto, Chino, Chino Hills, Mira Loma, Eastvale, Colton or San Bernardino; then visit our store in Rancho Cucamonga for your footwear needs. If you are looking for comfort shoes in Riverside, Moreno Valley, Corona, Rubidoux, Loma Linda, Grand Terrace, Redlands or Norco; then visit our store in Riverside for your footwear needs. If you are looking for comfort shoes in the Temecula Valley, Murrieta, Fallbrook, Lake Elsinore, Wildomar, Hemet, San Jacinto, Pala, Sun City, Menifee, Canyon Lake, Perris, Bonsall or Anza; then visit our store in Temecula for your footwear needs. If you are looking for comfort shoes in Palm Desert, Indio, Coachella, Thermal, Vista Santa Rosa, Rancho Mirage or Bermuda Dunes; then visit our store in La Quinta.